Is Your Relationship [with food] Unhealthy? So you're in this unhealthy relationship - all the signs are there - what do you do? If you're smart and have any self respect, you sit down (face to face), sever the ties and say, "sorry sweetheart, we're just not good for each other". But what if your relationship with food is unhealthy? You sleep with that mistress at least three times a day and you can't exactly walk away on amicable terms, can you? There's a paper thin line between being conscientious about what we feed our bodies and being overly restrictive and compulsive about what we eat or don't eat. So, do you have a healthy relationship with food? Strangely enough, our bodies have these great innate cues that tell us when we need food. But when was the last time you ate in order to feed your body as opposed to eating simply because you wanted to, or because you had a craving? That's like changing the batteries in your fire detector before that annoying warning beep sounds…that's ludicrous! No one does that. So why would you fuel up before your body sends out it's 'feed me' warning signs? Listen to your body and be mindful of all your senses. Our bodies are well designed machines that sometimes get overruled by our easily-influenced and hormonal brains. 2. 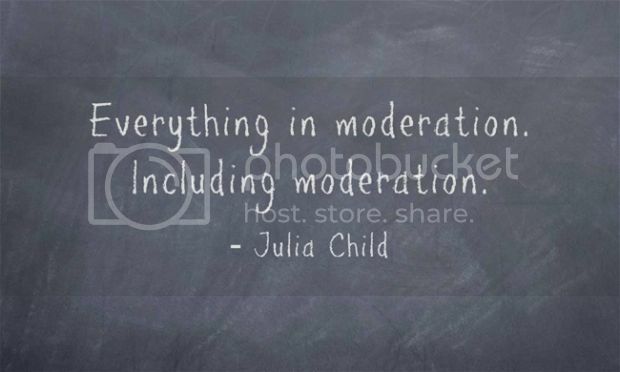 Follow the "everything in moderation" rule. Yep. Everything. Food is not intrinsically "good" or "bad". Sure, some foods are better for you than others, but will you get fat or develop diabetes because you eat processed, chemical-laden potato chips once every few weeks? No. Will you get fat and/or develop diabetes if you eat them every day? Yeah, maybe. Eating is a way to nourish your body - nothing more, nothing less. Some foods fit the bill, while others don't, but that doesn't mean they are "forbidden foods". It just means you shouldn't eat them all the time. 3. Know that timing matters. Is is bad to eat chocolate? Well, no. But is it better to eat a piece of chocolate after you've satisfied your hunger with a belly-filling, well-balanced meal as opposed to snacking on the sweet treat when you're so hungry you could gnaw off your own arm. Think of the following situations. 1st. You get home from a hard day at work and you're starving. You order a pizza. After waiting 30 minutes for it to arrive, you dive in and binge on half the pie. 2nd. You get home from a hard day at work and you're starving. You order a pizza. While waiting for it to arrive you decide to enjoy a healthy belly-filling salad/soup, followed by a slice (or two) of pizza upon arrival. Who wins in that situation? Clearly, he/she who chose the path less travelled - the 2nd option. 4. Eat only when they are physically hungry. Emotional hunger is the devil. It's your brains way of applying a temporary balm to emotional stress or anxiety. The downside: usually you reach for comforting high-calorie foods that only make you feel worse about yourself after the fact. Dr. Edward Abrahms, a clinical psychologist and author of Emotional Eating, says, "when we use food to try to soothe an emotion, we mask what that emotion is trying to teach us, and instead replace it with regret or guilt for eating whatever we grabbed." 5. Stop eating when they are comfortably full. Have you ever eaten a meal, satisfied your hunger and then thought, now I need something sweet. That is not true hunger. We've become so good at learning to drown out our bodies hunger and fullness cues. Quiet your mind and listen for those messages. Your body changes with every bite. Pay it some attention. 6. Don't keep tempting foods in the house. It's easier to say no to temptation when it isn't screaming your name from the freezer. If it's causing you to stumble, move it out of the house. It's a much healthier habit to drive somewhere to get ice-cream once a week as opposed to battling with yourself on a nightly basis about cracking open that half gallon of chunky monkey. 7. Don't sit down with the whole bag. What more can be said, really? If you sit down with the entire bag, there's a very likely possibility that you will consume the entire bag…or at least more than you should. It's amazing how much that probably decreases when you sit down with a single serving and put the bag away. 8. Know the difference between a "snack" and a "treat". Snack (n.): a small amount of food eaten between meals. Treat (n.): an item that is out of the ordinary and gives pleasure. Chocolate is not a snack. 9. Give themselves permission to enjoy eating. It's not simply about being fed, but rather, nourished. Are you taking the time to nourish your body? Or are you scarfing down a to-go lunch in the car in a record-breaking 3 minutes? It's not about feeling guilty because you took time out of your day to eat instead of doing something else. It's about truly believing that you are worth sitting down and eating food. 10. Don't "make up" for a meal. Have you ever spent an hour on the treadmill because you ate something you shouldn't? Or maybe you've skipped an entire meal because you overrate at your last one? These are unhealthy behaviors stemming from an unhealthy relationship with food. Yes, you might occasionally overeat, but a healthier way of coping would be do have a lighter meal later in the day - don't go to the extreme of beating your body up to compensate for a few extra calories. 11. Don't eat to see the scale change. Ideally, you eat what makes you feel well. You'd eat what gave you energy and eliminated your acid reflux….you wouldn't eat simply to see a number on a piece of equipment drop. What are you serving? Your body? Or the scale? 12. Are not afraid of feeling hungry. Do you know what hungry feels like? When was the last time you were truly hungry? Hunger is not an emergency. 13. Don't let food concerns interfere with every day life. The secret: balance. Don't let this information overwhelm you. Being too strict and regimented can sometimes lead to disordered thoughts and behaviors. When was the last time you said no to life because of calories…either because you had a date at the gym to burn them or because you didn't want to have to say no to eating them in front of your friends? If you're missing out on normal social engagements in order to maintain a certain lifestyle, you might need to reevaluate your relationship with food. Newer Post"I don't want to get bulky"